The New Year is around the corner bringing the excitement of embracing a new start, new energy, and new opportunities. Now that the holidays are behind us, I wanted to share one of my favorite practices to help nurture health and wellness. It is “growing” my own sprouts, and believe it or not, it really is remarkably easy. Sprouting food is an excellent way to add in fresh, healthy foods even during these cold winter months when locally grown fresh foods are harder to come by. I love taking a dormant seed or bean, activating it, and watching it come alive. 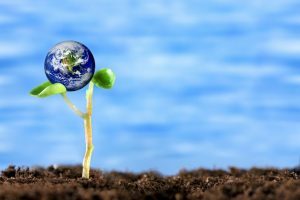 Having a seed sprout is also a perfect metaphor to the process of nurturing the potential for health and healing in our own lives. Watching that little sprout come to life helps me to know that, with the proper conditions, the seeds of something new can grow. Plus, seeing those baby sprouts fills me with hope and anticipation for the coming spring. You may not realize just how EASY it can be to sprout so I wanted to share with you my technique for sprouting my favorite: mung bean sprouts. A beautiful batch of healthy, sprouted, mung beans are like and infusion of newness and life even in the depths of winter. And you are likely to be delighted by how delicious and incredibly healthy these little mung bean sprouts can be. Step 2: Decide on how many you would like to sprout. Rinse chosen amount of beans in cool water, remove any broken ones, and drain. Step 3: Put the beans in a bowl or pot, add enough filtered room temperature water to extend over the beans by at least 3 inches. Cover bowl or pot with lid or towel. (The lid or towel helps to mimic the darkness in the soil where the beans might naturally germinate.) Let soaking beans sit at room temperature overnight for 12-24 hours. Step 4: After 12-24 hours of soaking, I am always so excited to see how much these little beans have already changed. They have swollen in size and have taken on a brighter green color. When I see this I am reminded that these foods are truly alive. At this point you will want to discard all water and rinse beans GENTLY in a colander. Then take a clean, 100% cotton flour-sack towel, wet it, and lay it out on a cookie tray. Spread the soaked beans out in a single layer on the wet towel. Cover beans with another damp clean towel. Step 5: Place the cookie tray with the covered beans somewhere out of the way where they can continue to sprout. They will “grow” and be ready to eat after another 36-48 hours. At my house, I do not have a lot of counter space so I tend to store the cookie trays with sprouting beans in my oven that is kept turned OFF. (Note: If you store the trays of sprouts in the cold oven, be sure to tell anyone else in the house! My husband once turned the oven on to 400F when I was sprouting my little beans and killed them all! May they RIP.) It is a good idea to check on the sprouts once a day to make sure the towel is damp. If the towel begins to dry out, spritz it with water to make it damp again. Step 6: After around 36-48 hours, I am always thrilled to see that my little beans have grown tails. At this point they are crispy and delicious to eat. These beautiful live foods are filled with activated nutrients and enzymes that infuse the body with nourishment and promote health. You can store sprouted beans in the refrigerator in a glass bowl with a lid and enjoy throughout the week. 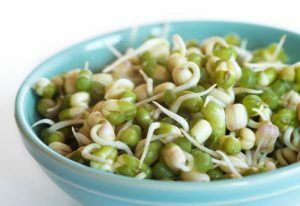 These protein packed sprouts can be added to salads or enjoyed mixed into many healthy super food bowls and dishes. 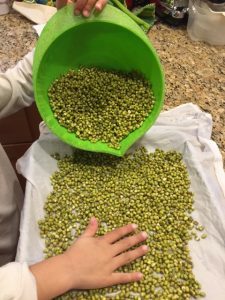 I enjoy sprouting mung beans year round but I find that, especially in the winter, these sprouted mung beans are a perfect way to enjoy a fresh, live, nutrient-dense infusion of healthy food. One of my all-time favorite ways to enjoy sprouted mung beans is to mix a 1/2 cup sprouted mung beans with 3 tablespoons roasted and salted sunflower seeds, and 1 teaspoon high quality balsamic vinegar or a tablespoon of balsamic salad dressing. This makes for a delicious snack or an excellent side dish. If you have children, I have found that they LOVE growing sprouts. Plus, children are very likely to eat these cute little sprouted beans if they have grown them themselves. My kids love eating sprouted mung beans and enjoy them by the handful! I even put these protein-packed sprouts in a little containers in their lunch boxes. My focus in 2018 is to offer more support around gorgeous, natural, nutrient-dense foods that enhance health in the body. If you would like to learn more ways to support optimal health, recovery and wellness, you are welcome you to join me on January 18th (11am-2pm) or February 8th (5:30pm-8:30pm) for the next Food as Medicine workshops. Here’s to making healthy eating more joyful, easy, and delicious! And here’s to your health! Joanna’s Sprouted Mung Bean salad with roasted salted sunflower seeds and organic balsamic vinegar is delicious. I immediately got mung beans to sprout right after the class …and have been sharing the high protein delicious snack with all my friends! Huge Thanks Joanna for your wonderful Food as Medicine Class.